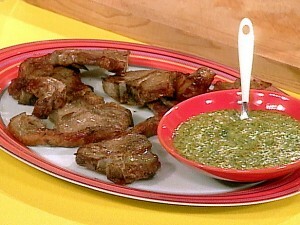 Lamb Chops recipe by Razwana at PakiRecipes.com. Put everything in the pot and leave on the gas. Not too much water as much as the lamb chops are coverd and then let the meat be nice and soft as the water dries. Put on a small heat and put the lid on the pan and pick it up and shake it so the chops dont come off the bone and put in a plate. Serve with chopped onion as small as possible. Add mint sauce and tomato ketchup and serve. After the meet is done & u have put it in a plate. U should deep fry it.dip in beaten egg & cover with bread crumbs to make crispy then fry. what is this DUFFLE MURICHA?